Decades before the era of the foodie and celebrity TV chef, Bocuse enjoyed rock star status among the world’s culinary cognescenti and started restaurants from Tokyo to New York. 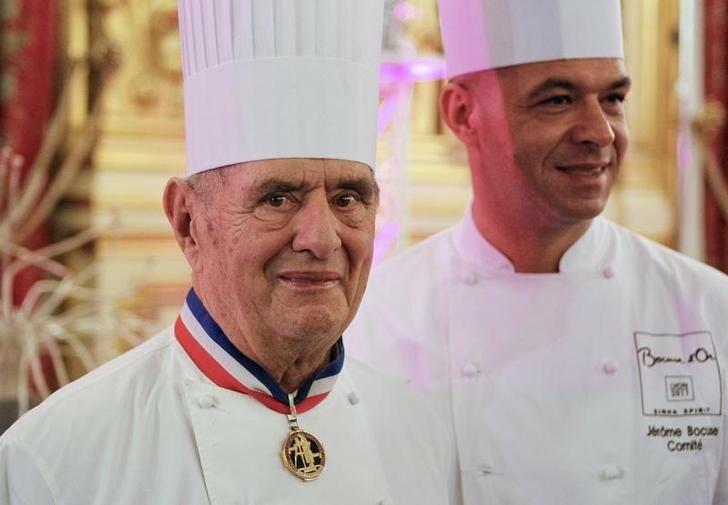 “Paul Bocuse was the incarnation of French cuisine,” French President Emmanuel Macron said in a statement. L’Auberge du Pont de Collonges near Lyon, originally the restaurant of his father, was the nerve-centre of his culinary empire, comprising 21 restaurants with annual sales of more than 50 million euros ($61 million), according to French business magazine Challenges. Already well-known for the menu of the maiden flight of the Concorde airliner in 1969, Bocuse’s flair for showmanship led him to ask President Valery Giscard D’Estaing to allow him to prepare his own banquet at the Elysee Palace when he won France’s highest honor, the Legion d’Honneur, in 1975. He was also a mentor to young chefs and a passionate promoter of his trade. In 1987 he launched the Bocuse d’Or, pitting 24 chefs from across the world against each other in what continues to be the world’s most prestigious cooking competition. Bocuse was widely credited as a founder of French “nouvelle cuisine” – a more delicate style of cooking that relied less on heavy sauces. But he himself shunned the label, maintaining that above all meals should be “an uninhibited pleasure” and not encumbered by concerns about good health or weight loss. The legendary black truffle soup he made for Giscard D’Estaing, still served at his restaurants, is enduring testimony to recipes far richer than those with which the ‘nouvelle’ label came to be equated. Deceptively light and free of cream, the soup’s fresh raw truffles, foie gras, butter-drenched mushrooms, carrots, celery and onion are all bathed in a poultry broth and entombed in a pot-belly bowl under a lid of golden, flaky pastry. Variously accused of intolerable arrogance, an undignified passion for self-promotion and of spending more time in jets than kitchens, he was nonetheless credited with restoring not only the prestige of French haute cuisine but the status of his profession. In a tribute to his longevity, he was crowned “chef of the century” by the Gault et Millau French gourmet dining guide and likewise in 2011 by the premier U.S. cooking academy, the Culinary Institute of America, in 2011. Born on Feb. 11, 1926, at Collonges-du-Mont-d’Or, near Lyon, in southeast France, where his forebears had been restaurateurs for generations, Bocuse’s education was ended abruptly by World War Two, when he left school to join the resistance movement. L’Auberge du Pont de Collonges acquired its first Michelin star in 1961 when he was helping his father build up the business, and after his father’s death he took it to the top three-star status in 1965. From there he expanded with restaurants in Tokyo, Singapore, New York and Florida, as well as in France, and in 1990 launched a schooling network for top chefs. Childhood sweetheart Raymonde, whom he met at 16 and with whom he had a daughter, Francoise, was his wife of nearly 60 years. He had a son, Jerome, who now works for the American side of the Bocuse business, with his first mistress, Raymone, in 1969. And he launched a Bocuse-brand products business in the 1970s with his second mistress Patricia.